This boat was completely rebuilt just a few years ago, It's very spacious, and the interior is clean, bright, modern, and new. Click on the icon of the floor plan at the bottom of this page, and then click on any of the camera icons on the floor plan page for a picture taken from that angle. The boat is rented fully furnished; including cutlery, crockery, towels and bed linen. There are 2 toilets as well as a separate bathroom; there's a great restored antique bathtub and thermostatic shower. The open kitchen is custom built in teak, with a 5 burner gas stove, microwave and conventional oven, double sink, and built in fridge. The wheelhouse is always bright, with a wide view. The windows in the hull give a great outlook across the water from a low angle when you're below. There is always lots of sunlight, even in mid-winter. There are 2 bedrooms, kitchen / livingroom, lots of storage space in several closets, a laundry space [wash machine included], as well as the large wheelhouse. The wheelhouse has a little sink and a stove. The front bedroom is separated from the livingroom area with a wall that can be dismantled and reassembled in different positions, allowing the space to be customized; the front bedroom can be made larger, becoming a workspace or studio, or smaller to maximize the livingroom area. There is city water and mains electricity. Well insulated, centrally heated with an oil furnace [new]. Fixed line phone and cable TV are available. On top of the ship is a 60 square meter hardwood sundeck. The location is the brand new Haparandasteiger at Houthavens. Houthavens offers a big sky, without buildings obstructing your view. Have a look at the map [link at the bottom of this page] to see the exact location. You get sunrise and sunsets, as well as rainbows. It's a friendly, easy-going place where everyone knows their neighbors. Bus service is a 500 meter walk, Amsterdam Central station is 10- 15 minute by bicycle. Road connections to just about anywhere are very good, with the main ring highway just a few minutes away. The Vrije Muselaer gets unobstructed sunlight all day, even in winter. Click on the thumbnails for big pictures of the outside, the third one is a map showing the location. For lots of interior pictures; click on the floor plan below. On the floor plan page, there are red camera icons, just click on them for pictures taken from that angle, or use the "Next" button on the top of each page for a virtual walk through. These are fairly large files, but if you want to see a nice houseboat, it's worth the download time. A single parking permit is available for the registered resident of this address. Parking is on the street at the beginning of the pier. * Utility costs are charged for actual use, you pay exactly what I pay. This boat is large and heated with oil, which is expensive in NL, so this cost is normally 250 per month. City taxes are not within my control and will be billed to the registered occupant by the city; but I will pay the Precario [liggeld], which is the only big one. Others user taxes the same as an apartment, a couple of hundred a year. Security deposit €2,500, and I will require proof of employment before viewing. Sorry, but I get a lot of dreamers and I won't disturb the sitting tenant for viewings before I'm confident that you're a viable tenant. Contract period is 12 months with another 12 months automatic extension. I require 3 month notice if you wish to vacate sooner. Subletting [airbnb, etc.] violates my insurance and is absolutly not allowed; eviction will be imeadiate. There is construction in the area during working hours during the week. It may be disturbing if you're on board. At some point, when that work is complete, Probably in 2020, the ship will be moved to a new location in the new neighborhood being built. This is beyond my control. At that time, the sitting tenant can choose to stay or vacate. There will be plenty of notice. 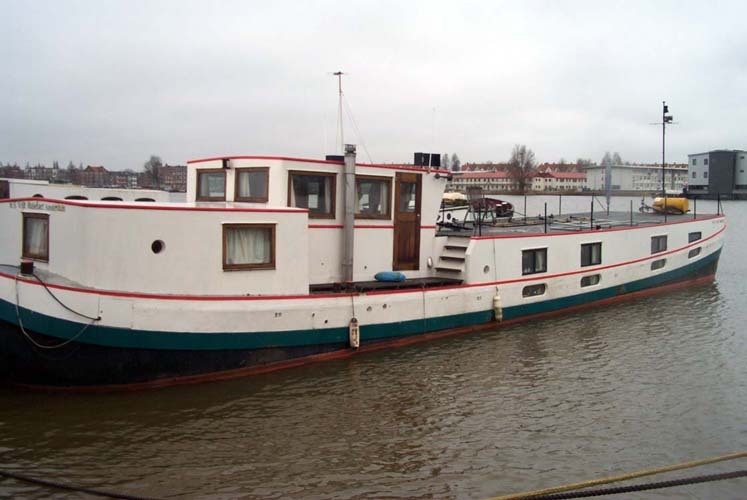 Tenants of houseboats in the Netherlands are not covered by tenants rights laws. I use an English contract; ask for a copy if you want. How to check that I'm for real [or any other houseboat owner]; I don't publish my name on this site, but I don't make a secret of it either. Just google [website name] + whois. You will find my name, address, and how long I've owned this site. Now call waternet Amsterdam, and ask for woonschip divisie [houseboat division] Ask them to confirm that I am the owner of the vessel at Haparandasteiger 14. Walk by the address and have a look, see that the boat in the pictures is the one at the address. If that's not enough, ask the neighbors there. They know me; I've owned this boat for 15 years.